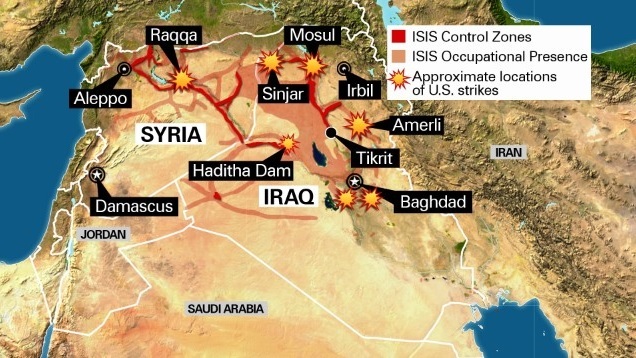 The U.S. goes after ISIS inside Syria. Puzzling questions plague Hannah Graham's disappearance. And President Obama sounds the alarm at the U.N.
Punch in the nose to the bully: That's how one analyst put it after the U.S. launched airstrikes against ISIS targets in Syria. Perhaps the most surprising part was who joined the United States: Bahrain, Saudi Arabia, the United Arab Emirates, Jordan and Qatar - all Arab countries. We know that the attacks decimated several ISIS facilities, but we don't know the exact extent of the damage. One activist in the city of Raqqa, which bore the brunt of the attacks, said ISIS fighters have stepped up patrols. "I would dance in the streets, but I am too afraid," he said. Front and center: The U.N. General Assembly gets going today, and the first item on its long list of issues to tackle? Climate change. Expect an address from President Obama on the topic - and a chance for him to shift the conversation away from ISIS or Ebola or other national security matters. Obama will ask world leaders to come up with a plan to avert an environmental disaster. Time is ticking. 800 rounds: That's how many rounds of ammunition cops found in Omar Gonzalez's car after they caught the Iraq War veteran who had hopped a White House fence and sprinted past the north portico doors. They also found two hatchets and a machete in his car. His family says he suffers from PTSD. The incident prompted the Secret Service to beef up its presence at the President's residence. Many questions, few answers: Graham is a second-year straight-A student at the University of Virginia who disappeared on September 13. What we don't know is if she was abducted and how a man named Jesse Matthew is connected to the case. He was the last person to see Graham, and yesterday, police issued a curious wanted poster for him. It says he's wanted for two counts of reckless driving. But then, at the bottom, it says police would like to speak to him about Graham. Run for the border: Three Afghan National Army officers - guests of the U.S. military at a training exercise in Massachusetts - disappeared Saturday from a mall trip ... and reappeared yesterday in the custody of Canadian border guards. The military, State Department and other government agencies are remaining especially quiet about the choice the three Afghan officers made to go off the radar. They won't even say if the trio were seeking asylum in Canada. They did, however, add that they didn't pose a threat to the public. - Luckiest cyclist EVER: This will make you cringe, and then breathe a sigh of relief. - Who says cats aren't affectionate? You just need to get yourself a big one - a really big one. –Who knew: Chickens as security guards? We learn something new every day. The genius driving into oncoming traffic should've gunned it and they would've made it no problem, but they chickened out halfway through and caused a big scene... When you do that the commitment starts as soon as you pass that first car. You gotta stick with it. The cyclist had God's hand over them for sure though. Luckiest cyclist EVER is understated!!!!!!!! He had to have had guardian angels surrounding his whole being!!!!!!!! And I never thought that I would be awake this early in the morning watching a video about security guard chickens!!!!!!!! OMG!!!!!!!! LOL!!!!!!! !